Eat In My Kitchen will be out worldwide in 34 days (in English, on October 4th) and my German book will see the book stores even earlier, in less than a month, on September 26th. It’s becoming real. It’s the transition from a project that existed as an idea in the heads of a handful of people to a finished, physical book, which will lean against other books in book shelves and hopefully come to use in many kitchens. Soon, this transition will be complete and then it won’t just be my ‘baby’ anymore. Then it will be out in the world, it will live its own life, create lots of stories around food, and I won’t be a part of it anymore. Soon, it won’t be in my hands anymore. You could say that it’s not really a huge difference to the blog, which is true to a certain extent. 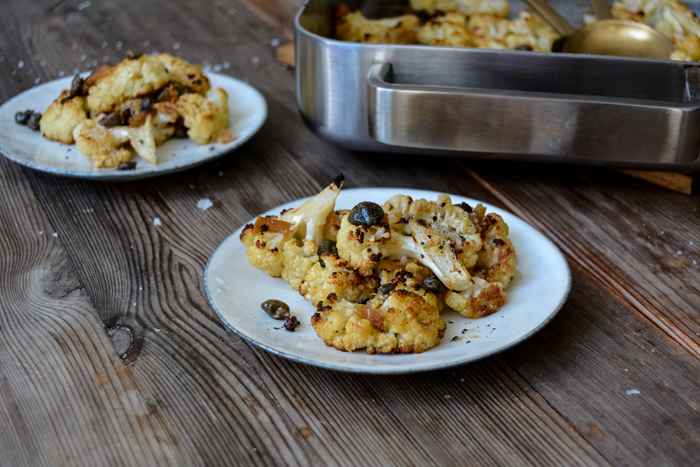 For almost 3 years I’ve been sharing my recipes (more than 600) here, in the digital world. Whoever felt inspired cooked or baked them, many sent me pictures or emails, and enjoyed it. This interaction still made me feel like I’m a part of it, a part of my Eat In My Kitchen blog that changes constantly, it grows and evolves. But the book is different, it’s done, it’s printed, it reached the warehouses already, there’s nothing I could change, even if I wanted to. Now, I have to learn to let go. Although there’s no work left to be done on the physical book, there’s tons of organization left. My book launch events in London, Berlin, Malta, New York, and Washington seem to need my attention 24/7, there are interviews and photo shoots on my schedule, and so many things that come along with a book, things that I never thought about. It felt like a lot of work writing this book, but to send it out into the world seems even more crazy. I have a habit, whenever my life resembles a rollercoaster, I try to be a little more disciplined and create a rhythm that I stick to. I have my rituals, I take Saturdays off, I go jogging more regularly, I set up more tea time breaks than usual, and I don’t skip dinner. It’s often quite simple, due to a lack of time and inspiration, but that doesn’t matter. I chop my vegetables, nibble on my cheese, and sip at my wine glass (not every night though). I try to create normality within the chaos, a routine, and that helps me. My current life leads to recipes that neither require much work or time, nor many ingredients. Unfortunately, the time that’s left for my beloved grocery shopping decreased considerably in the past few months. But there’s no need to complain, those dishes created out of spontaneity taste just as good. 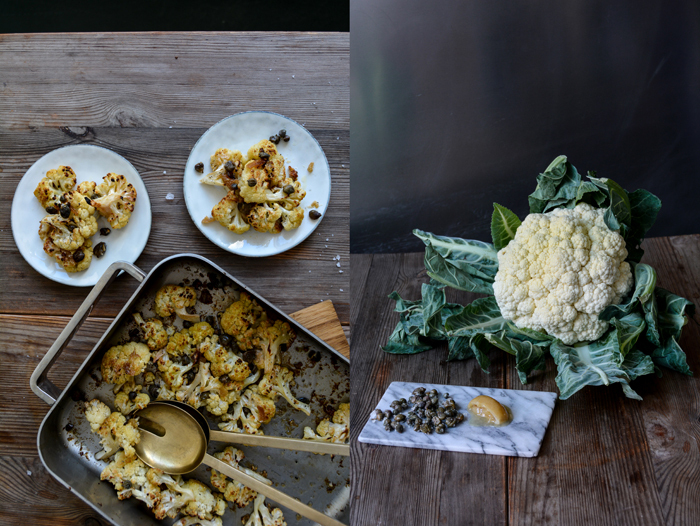 On one of those late nights, I opened the door of my fridge, I spotted a head of cauliflower, a jar of my homemade preserved lemons, and capers from Malta. I cut the cabbage into pieces, tossed it in olive oil and my tasty preserves, and ended up with the most delicious comfort food. It was a happy night. 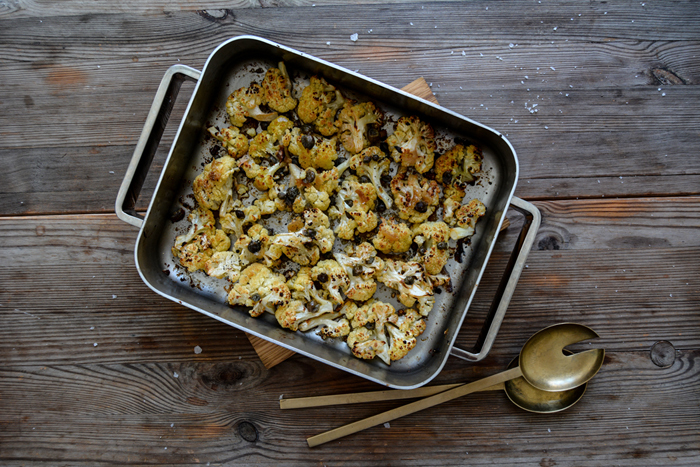 Spread the cauliflower in a medium baking dish. Add the olive oil, preserved lemon, and capers and toss to combine. 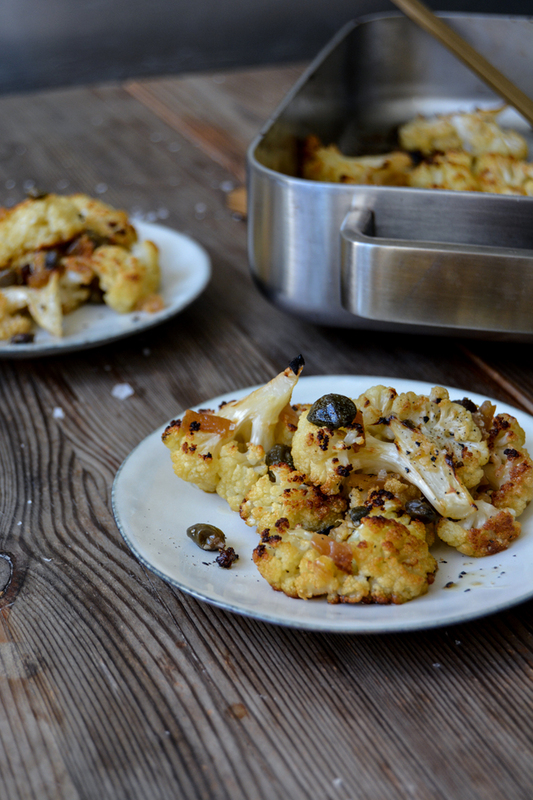 Season with a little flaky sea salt (mind that the capers are salty) and crushed pepper. 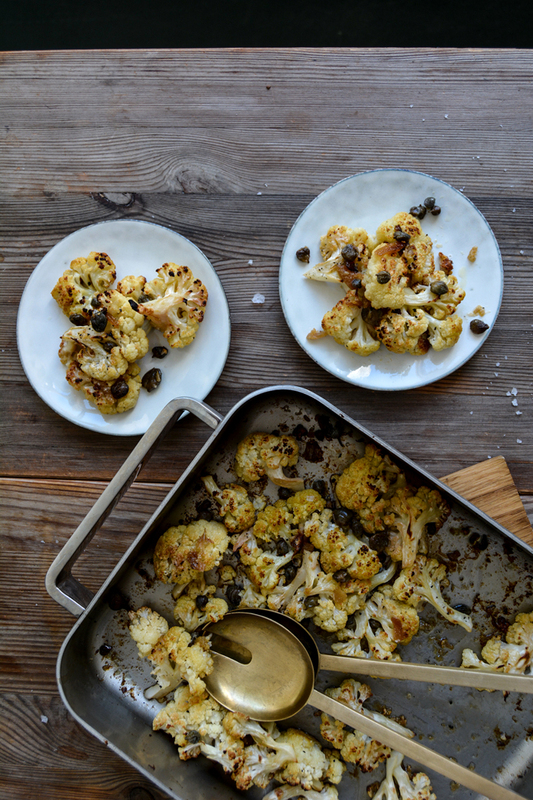 Roast for about 18 minutes or until the cauliflower turns golden. 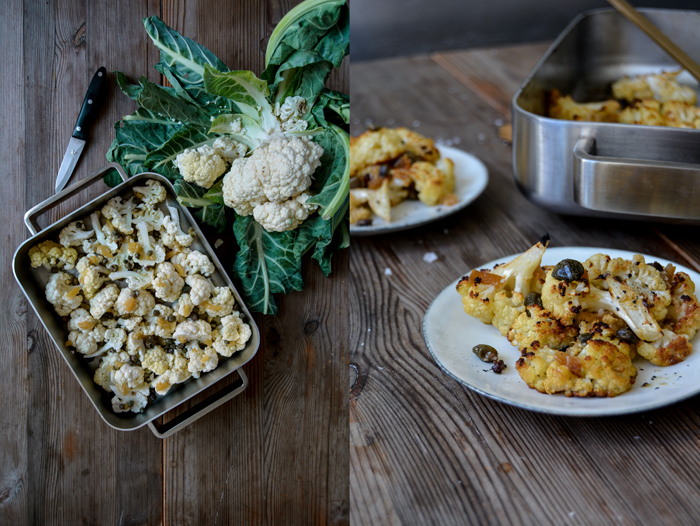 Flip the cauliflower and roast for about 15-20 minutes or until golden brown, turn on the grill (broiler) for the last few minutes, if you prefer it a bit more crispy. Serve warm or cold.